I have a doll from my mother-in-law that I wanted to dress for my adult step daughter to surprise her. I can't find any marks on the doll and she has no clothes. I would like to dress her so she looks original. Can you help me with this. The doll is 10 inches long. 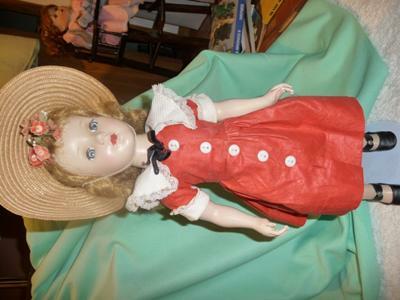 I also have another doll that is fully clothed in great condition,that has no marks on it that my daughter would like to have but I would like to give her a little history on it before I give it to her. Wasn't sure what you wanted in the Enter Your Title, so hope I did it right.